In view of the end of support for Windows XP, from April 2014, the powerful and free Linux Operating system may, at last, come into its own. In fact, I am now installing Ubuntu on a number of older machines.. See more on the XP page. HISTORY : For many years big computers have run with an operating system called Unix. Around 15 years ago a young Finn called Linus Torvalds decided to use his programming skills to adapt Unix to a new version which would be Open Source. It would be free of charge and the code would also be open to anyone with the skills to adapt it and add their own variations. As a result there are many versions of the original Linux. However, four have bubbled to the top in popularity and it is recommended that you stick to one of these. Their names are Ubuntu, Fedora, Open Suse and DSL (Damn Small Linux). Apart from cost there are a number of other advantages which Linux has over Windows. All of the versions take up much less room on a computer hard disk (and can even be run from a CD or USB key) and are a great deal less demanding of processing power. This means that they run satisfactorily on slower, older machines with small hard disks. Another advantage is that they are not so prone to getting viruses. But is Linux anything like as powerful and 'friendly' (easy to use) as Windows ? 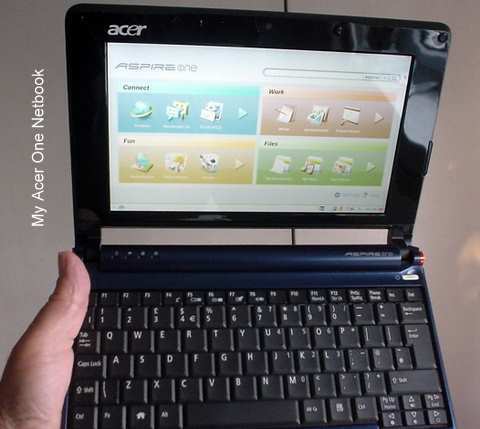 My first impression, when I obtained a netbook, was that it was a great deal simpler to set up. Many programs had already been installed or were a part of the Operating System. Within half an hour I was able to connect to the internet (wirelessly or by cable), send emails, do Google searches, import photographs, play music and videos, and, because it came with Open Office installed, I could read and write Word compatible (Doc and Docx) documents, run an Excel compatible spreadsheet or create a Powerpoint compatible file. The Ubuntu disk that came from Computer Active would even take care of 'partitioning' your Windows hard disk so you could run both Ubuntu and a Windows program on a PC. It will also enable you to transfer things like pictures between the two and look at Windows files on the same machine. And there is a program called Wine from www.winehq.org that would even let you run many Windows programs.. While some of the lesser know distributions (Distros) of Linux may run fewer programs Ubuntu and Fedora provide a mass of downloadable 'Apps'. You can download a copy of the Ubuntu installer (690Mb) from HERE and you will see instruction on that page as to how to create a disk. See HERE They suggest getting cheap write once CDs for this purpose. ** Ubuntu is a Bantu word for a humanist philosophy. A person with Ubuntu is open and available to others, affirming of others, does not feel threatened that others are able and good, for he or she has a proper self-assurance that comes from knowing that he or she belongs in a greater whole and is diminished when others are humiliated or diminished, when others are tortured or oppressed. And it is even possible to run Windows programs under Linux : WINE is a popular program wor Linux or Mac users to enable this. August 2014 Installing Ubuntu on an old PC is straightforward. See http://www.ubuntu.com/desktop/features/social-and-email You will have to make sure that the machine will start from a CD. This means a look at the BIOS. But most machines already are set up this way. So, put your Ubuntu disk in the drive and restart the machine.Ubuntu displays a series of red dots on screen. Eventually you are asked whether you want to just Try out Ubuntu from the disk or Install it. By all means have a look at it.first. It takes a while to start from the disk. If you are happy to install, reboot the machine. You will see an option to install it alongside your current Operating System or instead of it. Read any release notes. Agree to download any updates. Agree to download a 3rd party MP3 player plugin. If you replace your OS it will delete all data and will take less space. If you install it alongside it will require 4Gb of space to install it and connect it to the internet. It will need to create another partition on your hard disk. The program makes it easy to resize partitions. Ubuntu supplies a number of free programs to replace Microsoft ones. e.g. Firefox for browsing, Thunderbird for email, Office Writer, Calculator, Impress ((Powerpoint) and there is an online software centre where you can download additional programs e.g. Picasa. n.b. While these programs will read Microsoft format data, such as Word, Excel, Powerpoints, there might be slight differences and techniques. Ubuntu readily offers to connect to the internet either wirelessly or by cable.It also has drivers for most peripherals such as printers and scanners. So it really is a reasonable alternative to Windows.and it has a better security record.